Orion Scalability Engines Extend your monitoring with enterprise class scalability for the Orion Platform. Scale up, scale out, or get more visibility into the network you have. Scale monitoring capabilities of the Orion platform as your IT infrastructure grows and needs change. Additional polling engines expand the number of elements or apps that you can monitor. 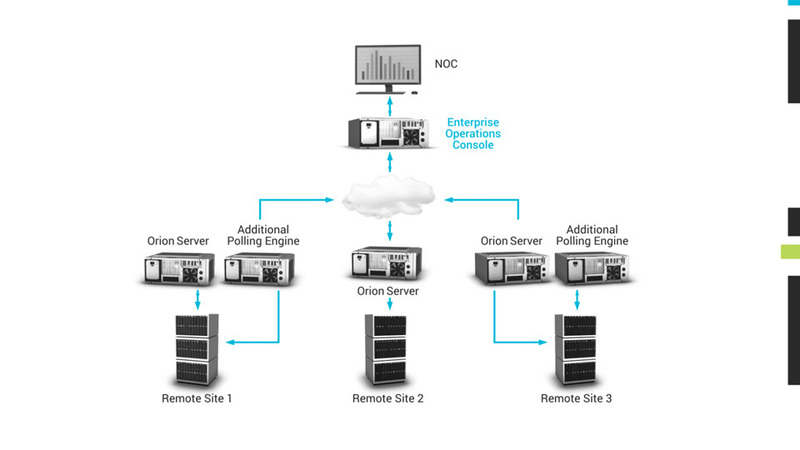 Additional web consoles increase the performance and scalability of the Orion web console as the number of users increase. If you have more than 20 simultaneous users accessing the web console, load-balancing the number of concurrent users with an additional web server may bring performance improvements. Monitor more elements, poll more frequently, or cover more locations. Increase frequency of polling, easily monitor remote locations, or scale to up to 12,000 additional elements per additional polling engine. Help ensure 24/7 availability for your Orion servers and pollers across subnets. Protect your monitoring environment against O/S crashes, application failures, network connectivity problems, and database availability issues with SolarWinds® High Availability. Gain unified visibility into multiple SolarWinds instances. Roll up performance data and status from multiple SolarWinds servers to a single consolidated command center. 機能の概要 Scale up, scale out, or get more visibility into the network you have.